The Day Omolewa Ahmed Made Thousands of Women Smile – by Oyewale Oyelola – Royal Times of Nigeria. 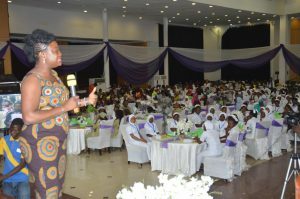 Women from different segments of the society including students, young and old as early as 8am on 7th March, 2018 were trooping into Kwara State Banquet Hall, GRA, Ilorin to attend a programme organised by the Wife of the Kwara State Governor, Deaconess Omolewa Ahmed to mark the 2018 International Women’s Day. To some of the attendees, it was another opportunity to eat free meal, hangout with other women, listen to the usual talk on the importance of women folks in the society, In fact, some attended the programme to take pictures with the state First Lady. 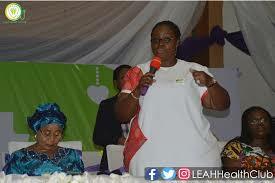 However, the plan of the governor’s wife who is also the founder of LEAH Foundation was entirely different as she has many goodies in place for women to push them forward in line with the 2018 theme – Press for Progress. 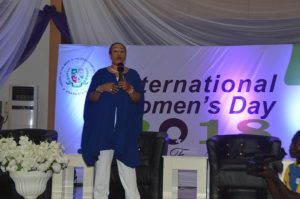 The day one event of the two-day programme was a symposium where successful women in business, agriculture, entertainment among other sectors shared their thoughts with the participants. It was an inspiring episode for attendees, a revelation of what the woman can do. 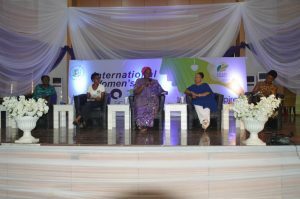 The speakers at the event included: Special Adviser to the Minister of Agriculture, Mrs Mosunmola, successful business woman, Mrs Ini Abimbola, the First Mechanic in Nigeria, Sandra Aguebor and famous comedienne, Bose Ogunboye, popularly known as Lepacious Bose. The speakers during the interactive session moderated by the humble and delectable Omolewa Ahmed herself, agreed that value addition is the critical ingredient to make a woman standout in the highly competitive society. 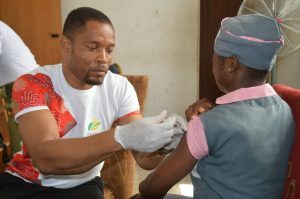 For instance, Mrs Ini Abimbola urged participants not to allow culture, religion and societal norms limit or talk them out of achieving their dreams in life. Mrs Abimbola said she established her flourishing businesses because of her determination to succeed and the quest to add value to the society. While Mrs Mosunmola advised young women to embrace Agriculture as a business, she lectured that AgricBiz is not all about farming. According to her: “Agriculture Business is not just about farming. Farming is just a phase of the value chain. You can start your Agricbiz by packaging farm produces, help farmers to market their produces in modern ways, design accounting software for farms and lot more. No degree is irrelevant in Agriculture Value Chain, so step out of your comfort zone and harness your potentials for productive activities”. 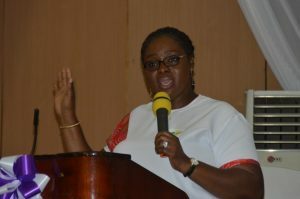 She advised women to desist from using Social Media Channels for gossips or less productive activities, adding that Social Media Channels should be used for business related engagements. 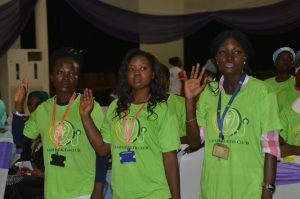 On her part, the first mechanic in Nigeria,Sandra Aguebor, urged women, especially graduates not to be certificate conscious as the world is moving to the stage where vocational skills will be the driving force of the economy. She disclosed that she trained as a mechanic from an illiterate despite having two degrees. After the questions and answers session, the first lady dazed the participants by announcing different empowerment programmes for 300 people through open balloting. This changed the atmosphere in the hall as every participant began to pray for God to smile on them. At the end, 20 women were given full scholarships to study Automobile, ICT, Building and Heating and Ventilation at the International Vocational Technical and Entrepreneurship College, IVTEC in Ajase-Ipo. Another 20 participants would get necessary support to start farming while 50 SMEs will be assisted with N50,000 to N200,000 loan to expand their businesses in the first phase of SMEs support. The wife of the Kwara State Governor did not just make beneficiaries smile, tears of joy flowed from the eye of five participants who got automatic employment to the Kwara State Civil Service. It was undoubtedly an emotional moment that will remain etched in the memory of many present at the fully packed hall. It is noteworthy that the empowerment was not just a public show or mere announcement for the press; the beneficiaries of scholarships filled the application forms on the spot and the documentation for SMEs was concluded on 14th March, 2018, just one week after the programme. Those given automatic employment have also commenced necessary documentations and will resume duty soon. Indeed, the programme, aside from inspiring women to press for progress, was also a turning point for many. The Kwara State First Lady and her team at LEAH Foundation should be commended for packaging such a wonderful event. 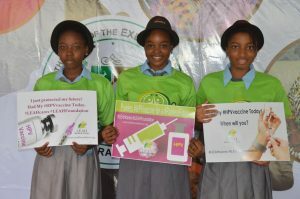 An appreciative first lady was full of praises for her husband, Governor AbdulFatah Ahmed for supporting the programme and thanked the Kwara State Government, Bank of Agriculture and other partners that contributed to the success of the programme. No doubt, the parting lines of Deaconess Omolewa Ahmed at the event would continue to resonate in the mind of many participants even for years to come. She said: ” I am a virtuous woman. I am committed to adding value to other women in the society and I know you can also be successful if you are determined. Therefore, Press for progress”. Oyewale Oyelola, a blogger and journalist writes from Ilorin, Kwara state.